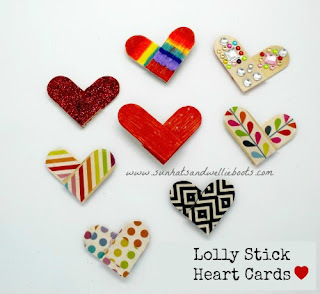 Did you see our Magnetic Hearts made from lolly sticks? Well, we couldn't resist making more. This time though we turned them into funky badges. This is a great craft for tweenagers to encourage creativity & self-expression, & would be perfect for any Brownie or Guide Group activity. 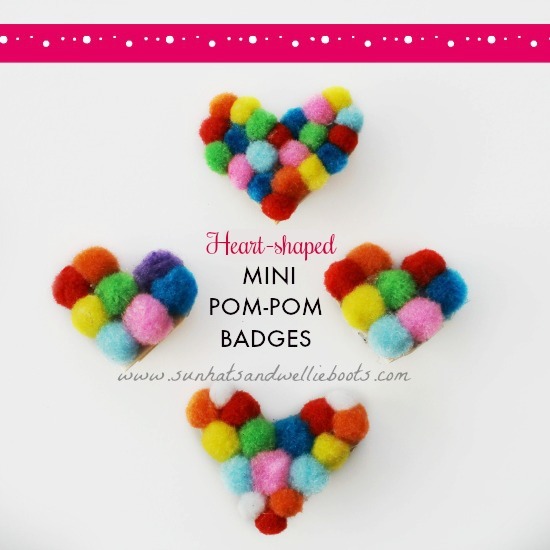 Badges & pins are an easy way for tweens to accessorize any outfit, & these heart pom-pom badges are perfect for showcasing your individual style. You could decorate them using bright bold colourful pom-poms, or create a monochrome design, use just a single block of colour, or throw together a random mix, the choice is yours. Create your own design to customize your favourite outfit, or make them to share with friends. We used a bag of small pom-poms which came in two sizes & found these were an ideal size for the hearts we had made. To attach the pompoms we used a hot glue gun. If you'd like to share this activity with younger children & are not keen on using the glue gun, there are some colourful self-adhesive pompoms available from Baker Ross. 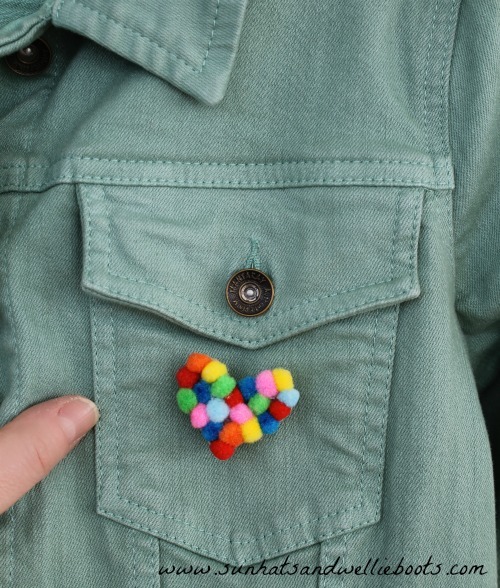 My kiddo loved creating these heart badges & soon made quite a collection. 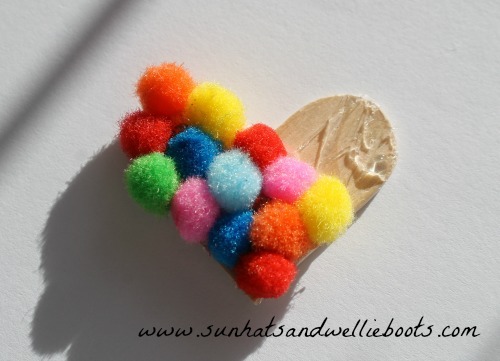 As she was making them she discovered it was easier to add the glue to the wooden heart & add each pompom separately, otherwise, the glue dried too quickly & just became messy. When she had completed her designs & the glue was dry she used the hot glue again to attach a brooch back to the reverse of the badge. 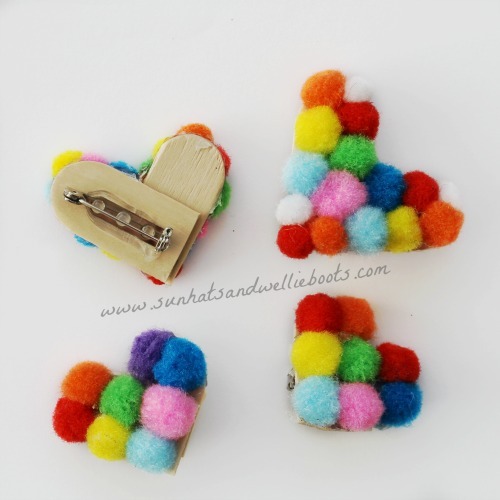 Our Heart pompom badges were ready to be worn & make a statement! My girl is wearing hers with pride! I think there's something awesome & empowering about wearing something you've made. It shows the world your creative spirit, your style, who you really are. And if you've made one for a friend, then it tells them how valued they are. Looking for more crafts for tweenagers?